We have amazing employees! We are spotlighting our talented employees with Global Thinking Awards, nominated by their peers, for their outstanding work and helping others to think globally and offer limitless choices. Each month Dr. Lindaman presents recipients with the award. Click here for an on-line form. This month’s recipients include: Brent Dinnebier, Major David Richards, Becky Runyan, Wendy Lee, Amanda Wagenhofer and more to come! Congratulations to the May winners of the Global Thinking Award, the Student Services staff! Brent Dinnebier: This staff member is described as someone who goes above and beyond to help students. By being very responsive to parents when they call or email, this award winner was nominated because of the extra effort put forth to support children in and out of school. One parent says because of this staff member, his son’s grades are all As & Bs! Major David Richards: This staff person is constantly involved, not only with our school but also the community. By making the learning meaningful and leading by example, this award winner is a positive role model to our students at West. Always welcoming toward any student, always committed to service and respect, this staff member deserves this honor because he exemplifies amazing leadership in our school and community! Wendy Lee: This staff person has been contributing to the district for several years. Her dedication and passion to building a strong foundation for all students is a model for other teachers in the district. She is constantly thinking about putting our students first and helping them be the best they can be. By working tirelessly during the day, at night, weekends and over breaks, she continues to improve her teaching and to provide the best for her students and parents. Her willingness to help students and other staff be the best version of themselves is priceless! Becky Runyan: This staff person is so valuable to Poyner’s learning community. By enhancing classrooms with insightful observations and interactions with students, she responds to e-mails promptly and if she doesn’t know the answer to your question, she will search to find it and get back to you! Honestly there are numerous ways beyond her job description she makes Poyner better, including coverage for before and after outside duties, knowing students on a first-name basis and having a cheery attitude! She is truly a role model for staff in our district. Amanda Wagenhofer: This staff member gets involved in everything! For example, helping at almost every family function that we have. If there is an opportunity to go above and beyond at Lincoln, she is typically involved. By always trying to find the positive in any situation, she never complains and has a wonderfully positive outlook that is contagious to those around her! Esther Rohret: Congratulations Esther Rohret on your Global Thinking Award!! This staff person is described as someone whose vision is amazing! The nominator writes, “While working with (her) during a professional development day, I was inspired by her ability to bring my ideas to life. I enjoyed working with her and I felt our time was true synergy. Her creation allowed me to envision a new way of collaborating. She taught me more in one day then I’ve learned in the past year.” She is patient, positive and easy to work with. Brenda O’Malley: This Orange staff member is described as awesome. Her end in mind is always how to get kids in the least- restrictive environment, despite whatever barriers they are trying to overcome in life! Thanks to her, one young man who was spiraling downward is now functioning more and more in the general education environment, identified as twice exceptional and receiving ELP services on the other end! Anyone would be fortunate to cross paths with her, as she can teach us all so much about compassion, patience and educational leadership. Julia Soyer: This staff person is a literacy model classroom teacher. Always willing to shar e ideas and try new things, this award winner provides Highland teachers with valuable professional development. By seeking to understand and learning with every opportunity, this person develops wonderful relationships with every student and family. She has high expectations for each student in her room as well as for herself! Ellen McKeown: Waterloo Schools is a better place simply because of this staff person. Confident, reliable and cheerful are words used to describe this award winner. Someone who is confident in the ability of every student to achieve at high levels, this person is supportive as a collaborator, teammate and friend to the entire staff. Her cheerfulness brings energy and strength to the whole Hoover family. No matter how many new initiatives are introduced, she is the first one to climb on board and bring the team along. She loves her job and it shows! Jeremy Ganfield: This staff person does a great job of trying to enforce the rules for students to ensure a smooth transition throughout the day. Offering good ideas and innovative engagement, this award recipient helps encourage staff and student relationships and safety. This person gets students to think about future possibilities and to strive for bigger and better goals. A true relationship builder! Student Services Department: Student Services processes and responds to the questions and concerns affecting the students of our community and schools, every day. The work of Studen t Services is ever-changing; no two days are the same. Each role in the department requires a staff member to exhibit the qualities of a good leader and independent thinker. They field numerous calls daily in an effort to assist others to think globally; they come together as a strong team to provide the best possible outcome for many scenarios. In making the decisions affecting the lives of our students, they have learned to keep the interest of the child first. They have built strong relationships not only with each other and their peers, but also the families of our community. Rosemary Amos and Christine Wilson: These two individuals are truly engaging young people through real-life lessons. They are responsible for teaching students all of the skills they need to be successful in their work lives. Through their teaching and patience, they help the young people at East feel good about themselves. Their leadership and positive encouragement provide the students with an incredible amount of support. They are a great team and are greatly appreciated at East High! Jaquis Galloway: This Global Thinking Award recipient has a positive influence on our children! He is an encourager, motivator and helps children focus on why it is important to learn. This person chooses to be positive and inspire each and every day. This award winner challenges others by taking the time to build relationships with students and their families. He is a role model to his children and teaches with discipline, responsibility and professionalism. No matter what, this recipient is a STAR! He represents our school well and is part of the glue that keeps our family together! Jessica Stakey, Julia Vilsaint & Corey Folkers, Lou Henry Extended Core Team: This TEAM embodies every sense of the word “team.” On the rare occasion that someone is missing, it is a noticeable difference as things just don’t work the same without all three of them! They teach us every day about patience and love, as they help their students find success in different ways. Teaching everything from basic communication skills to grade level material, this team works to find ways to help all students learn. Not only do they teach their students, they teach all of us, staff and students, how to be good people. There is no way to nominate just one of them, as they truly function as one machine. Cathy Stainbrook, Lincoln Counselor: This person is described as a helpful and caring individual who puts students first. Highly organized, this award winner is willing to step in and do whatever needs to be done to help ALL children succeed. Helping students in the school, but also reaching out to families outside of school to set them up for success in their education and personal lives is what this recipient does so well. By pushing the envelope to implement new and out-of-the-box ideas for student engagement, this award winner truly enhances Lincoln’s learning environment. relationships. Outside-of-the-box thinking, team building, accountability and leadership are a few things they impress upon the students at Irving. This team does not limit their students’ thinking, and definitely encourages others to do the same with their students. They lead by example and are truly working as a team. Smiles, hugs, hellos, and just plain being there…every single day. LeeAnn Remetch, Lowell/Orange/West Nurse: This person is always looking into different ways to expand her learning to pass on to staff. Always encouraging the students to think for themselves and be proactive, this award winner is there to help, guide, train and encourage those around to be better at all they do. Truly this person goes above and beyond for students by giving them a listening ear and support for what they’re going through. Odette Bulmer, Poyner’s Instructional Strategist:This educator brings a positive attitude each and every day. Described as someone who loves their job and who reflects that in the classroom with their relationship with students. This person brings new and innovative ideas into Poyner, giving students a toolbox of strategies necessary to be successful. This award winner has a “whatever is the best for the children” attitude and chooses positive! Elizabeth Carson, Kittrell Cook: This Kittrell staff person always goes out of her way to put students and their needs first. This person comes to work daily ready to work and is a very caring and giving person. Described as very organized and doing work that often goes unnoticed, this award winner truly lives life leading by example. Holly Carolus, Orange Kindergarten Teacher: This educator exhibits the term “kids first” to the tenth degree. Called a team player, she takes a “choose positive” approach to her work. She is a front runner and learner in new strategies and programs who is willing to do whatever she needs to in order to help others embrace new ideas to help children learn, feel safe, and above all feel loved. This winner is truly a Global Thinking Teacher who strives to bring the best to her students, families, school and colleagues! Megan Patience, Kittrell Teacher: This staff member is called a team player who is all about the stud ents. This award recipient addresses behavior concerns, makes contacts with parents and is so proactive with daily interactions in the classroom. Truly this person is an example of someone who follows the Leader in Me habits, so pleasant and positive. She meets every day with a smile and a word of encouragement for each student she comes in contact with! Lori Cooper, Tech Services: This award winner is described as always happy and friendly. This person is helpful and understanding and looks for the best way to explain how to do things and even offers support pro-actively with outstanding knowledge. If this person doesn’t know the answer, this award recipient finds it, always with a Choose Positive attitude! Brooke Schrage, Kingsley, Clerical assistant: This staff person has really stepped up this year to help keep our staff and students on track. The award winner has worked extra hours and taken on several duties not previously assigned. By synergizing with the staff and keeping a positive attitude the whole time, this person truly is an asset to our team! AJ Cassidy & Jessica Wass: These two staff members are described as great ambassadors for West high. They play a major role in setting and maintaining a tone of professionalism and purpose in our building. They both challenge staff to believe in all students’ abilities to be a change agent. These two award winners truly are global in their actions and are always working to BE WEST- Wise, Engaged, Safe and Trustworthy. Jeff Sommerfeldt: Congratulations to Jeff Sommerfeldt on his Global Thinking Award! He makes time for everyone, no matter how busy and makes the person fell they matter! Often doing a lot behind the scenes, this person does not get many thank yous as most people here do not realize all that’s being done. The nominator writes, “I am proud to know that he is there” and we are proud of all you do for the Waterloo Schools as well! Jon Decker: This award recipient enhances Expo’s learning environment in many ways. You can always see this person in the hallways making sure students are safe on a daily basis. This person truly cares about students and strives to make accommodations and modifications for those who may need a different approach to learning. He is very student-centered and patient with all of his students. You can tell he loves his job! Molly Carty: This staff person is always willing to learn and to try new things. Students who work with this winner are offered numerous opportunities throughout the school day to guide their own learning. Called a great leader for her grade-level team, she also is described as super organized and someone who always has a smile on her face willing to do what is best for students and families. Thank you for all you do to make Highland great! Allie Schmidt: This staff person is great at bringing in new ideas and strategies for us to use in the classroom. When something isn’t working or going well, this award recipient isn’t afraid to “think outside the box” and try new things. She always does what’s best for kids! Described as extremely professional and a team player, this person will help anyone who asks. She always comes to work with a smile and is making an enormous difference in kids’ lives! Kathi Corbett: This person always chooses positive, despite a lot of challenging situations and phone calls. No matter how stressful the circumstances, this award winner remains calm and collected and carefully guides those involved through the steps to reach a workable solution. 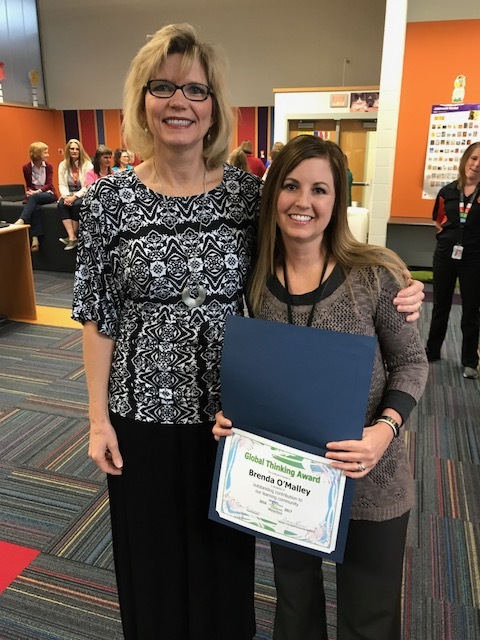 Always willing to ask for feedback and input from others, this staff person is a true asset to Waterloo Schools and all the families she serves–the recent flooding situation was just another example of her pride in professionalism! Danielle Hakeman: This award winner is described as a true leader who embodies professionalism in every setting. Called a thorough and devoted learner with new students, teachers and resources, this person offers support without micro-management. Staff, students and families wouldn’t be the same without this person’s guidance. She fosters an environment of change and growth through encouragement and best practice support. Anna Graf & Wade Timmins: These two staff members are being nominated together because they work as such a great team. They both really care about students and devote a lot of time and energy making connections with them. They enhance the learning community the most by being upbeat and proactive. Always available to listen and offer suggestions for any issue a teacher might bring up, these two award recipients are great at providing modifications and accommodations for any student. These two people deserve the Global Thinking Award because they represent positivity. They also work tirelessly to include differentiation to make sure that all students in our school are successful every day! Amanda DeWall: This staff member always has high expectations for our Lincoln students! This person exemplifies what a positive attitude looks like throughout the entire day. These attributes help this recipient enhance our learning community. This staff member has gone above and beyond helping others improve their skills, stopping into classrooms to help where needed. This person is a rock star teacher that cares about what is best for kids above all else! She always has a smile on her face and works hard to make sure kids know that she cares. She takes on extra duties and is always willing to support our staff to help make them more effective in the classroom. This recipient is a true team player that is always choosing positive! Chrissy Phillips: This staff person helps each student start their day off right. From daily hugs, pep talks, positive words and constant smiles, this award recipient is one-of-a-kind and makes each student feel special and loved. Her positive attitude is contagious. She is truly a treasure to staff and students. Some people bring out the best in others and that is totally this winner! Jenni Jorgensen: This staff person has a unique gift of connecting with students. By using a blend of songs, technology and current events relative to the lives of students, this award recipient brings excitement and energy to Bunger. This person contributes during collaborative planning and has created a cross-curricular alignment which contributes to the foundation for students. Called a positive asset to Bunger and someone we are lucky to have here, this person is a great fit for Bunger staff & students! John Hubbard: This staff person is always willing to go above and beyond. Continually posing questions to make us think about how we are meeting the needs of our students, this award recipient works to focus efforts on ALL students. Called professional, caring, compassionate, firm and fair, this person works to enrich the learning experience of everyone at Carver and is the perfect example of what it means to be a teacher! Sarah Fisher: This staff person is nothing but a tremendous team player. This person finds any and every way to help the students be excited in what they are doing and then communicates that with the families. Her love for teaching and working with kids is evident every day. She never complains about the amount of work she has to do, but instead she embraces what needs to be done and drops what she’s doing in a heart beat to help out her teammates. Every day this award recipient is here really early teaching and guiding her team members in curriculum. She is a leader that every team desires to have and because of her she is making her grade successful! Joni Smith: This staff member is a great example of flexibility and perseverance and going the extra mile to help students and staff. Not only is this person concerned about teaching the students all the subjects, but this award recipient is concerned about teaching them life skills – how to get along in the real world. While working with students, this person is bombarded with staff questions and always comes up with solutions that work wonders. This person is truly cool and confident and a role model for all of us! Tyler Babneau: This staff person has clear learning objectives for students. Not only is this award recipient an amazing teacher, but this person contributes to the overall success of Kingsley students. Always game for doing whatever it takes to push up sleeves and dive into the work with others to make Kingsley great, this winner is a hard worker that contributes so much to our staff. He makes Kingsley an even better place for his co-workers and the students he teaches! He makes music fun for all students and demonstrates their learning during performances- what an authentic purpose for learning and opportunity to celebrate! Sheila Butler: This person’s commitment to the students, staff and families at Cunningham is contagious! Always looking for ways to promote student success, this award recipient goes above and beyond to get kids to school, ready to learn and to help families access the resources they need to support their children. She was relentless in her efforts to get students registered and went out of her way to support families through the process. Her nominator calls her an extremely hard worker who is making a difference. Jennifer Schlader: This staff member does so much for our school that is above and beyond the call of any teacher. Truly this person puts her heart and soul into her job as an early childhood educator. She assures that every child in the school has the opportunity to learn about different subjects by bringing in different community members. She personally sets up every visit and creates each schedule so that the classrooms know when to go. She is always willing to lend a hand in anything that needs to be done and it shows in the relationships that she has built with the staff and students at Elk Run!